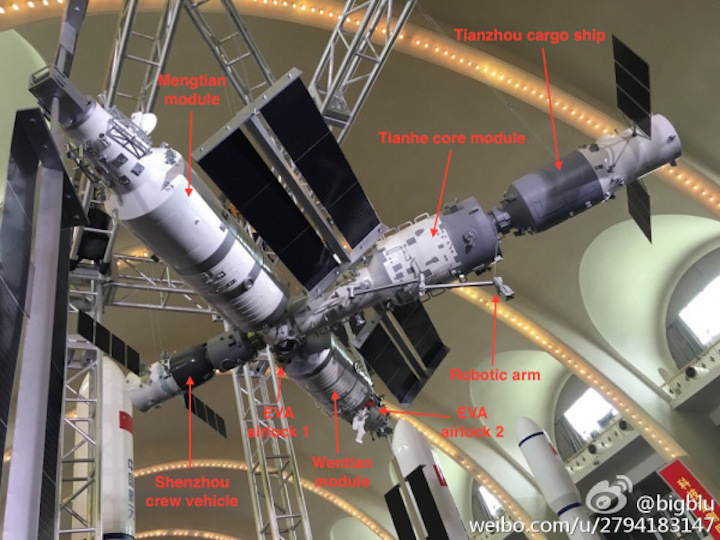 Core module of the Chinese manned space station Tiangong. Type: Space station module. Crew size: 3. Spacecraft family: Tiangong. Programme: Project 921-III. Agency: CMSA. Primary contractor:CAST. Status: Development. First launch: exp. 2018. Launch vehicle: CZ-5B. Launch complex: Wenchang-LC101. Orbit: 400 km LEO, 42.5º inclination. Mass (gross): ∼22,000 kg. Length: 19.1 m. Diameter: 4.2 m.
Tianhe (TH, “Heavenly Harmony”) is the core module and backbone of the Chinese space station, designed to provide the main living quarters and control centre for the station crew. The module resembles the Zvezda Service Module of the International Space Station in appearance and arrangement. An experimental core module, named Tianhe 1, is scheduled for launch atop a CZ-5B launcher from the Wenchang Space Launch Centre, Hainan in 2018. 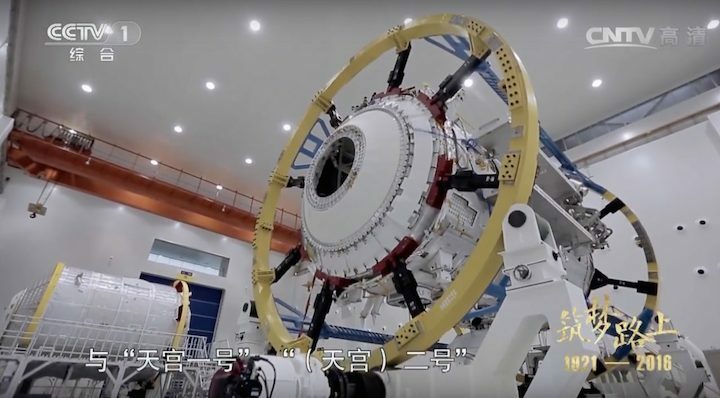 The Tianhe module is about 19 m in length and 4.2 m in diameter. The space frame is constructed of 5A06 aluminium-alloy, with a gross mass of 22,000 kg. The entire module is divided into three sections: a front docking hub, a pressurised living compartment in the middle, and an aft service compartment. 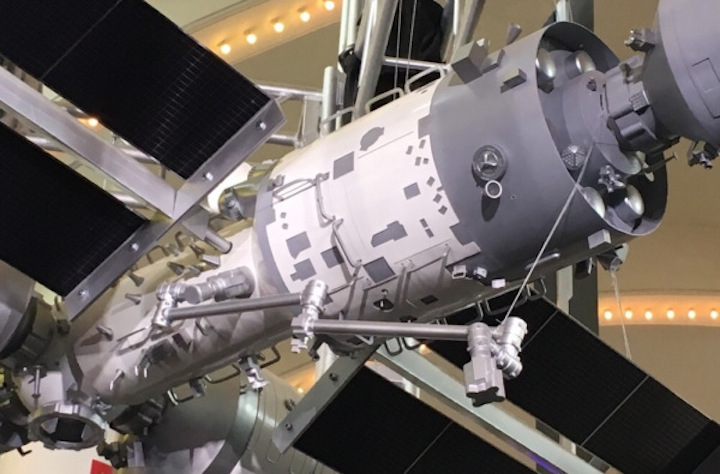 The module has a total of five passive APAS-type docking ports—four located on the front docking hub and one on the rear end of the service compartment. Externally the module mounts a robotic arm, two pairs of solar panel wings, and docking radar/optical sensors. The spherical docking hub located at the front end of the Tianhe core module provides four docking ports: two lateral ports used as permanent attachment points for the two laboratory modules, Wentian and Mengtian, and an Earth-facing port as the backup docking for Shenzhou spacecraft. The remaining port on the side of the hub facing away from the Earth is permanently attached to a small airlock module, which allows egress and ingress for spacewalks by astronauts and also provides a storage space to accommodate EVA spacesuits. The cylindrical living compartment provides habitable living quarters and main working space for a crew of three astronauts, including sleeping quarters, kitchen, space toilet, etc. It is also where the main control station is located, allowing the crew to manage guidance, navigation and control for the entire space station. A secondary control station which performs similar functions is located in the Wentian laboratory module. The transition section behind the living compartment flares outward from 3.35 m diameter of the living compartment to 4.2 m diameter of the service compartment. The aft cylindrical transfer chamber, also habitable, connects the the forward living compartment with the aft docking port to allow transfer of cargo and crew. The chamber is surrounded by the unpressurised service compartment, which accommodates the main engines, propellant tanks, power system, and communications system. The aft docking port is used for docking of Tianzhou cargo spacecraft, but can also be used as a backup docking port for Shenzhou spacecraft. The Tianhe module is powered by two pairs of solar panel wings, with a total span of 60 m. Each solar wing has 3 panels and is one-axis steerable in order to obtain maximum solar insolation. The silicon solar cells of the arrays have an efficiency of over 30%. Sun sensors between the panels measure the sunlight incidence angle which allows the panels to be automatically commanded to an optimum angle. Silver-zinc batteries in the service compartment provide emergency power in case of failure of the solar arrays. 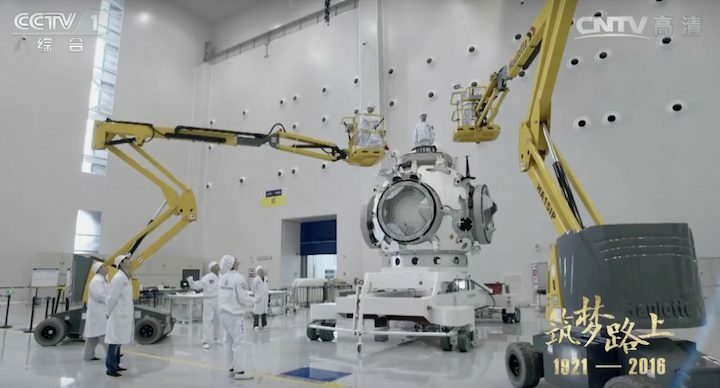 The spacecraft’s power bus operates at 100 V.
The CAST-designed large robotic arm is designed to assist the assembly and maintenance of the space station, move equipment and supplies around the station, and support astronauts in EVA.